After the introduction of smokeless powders in the mid-to-late 19th century, armed forces around the globe scrambled to research new rounds for their firearms using the new propellants. While the pre-WW1 period witnesses the birth of radical designs, 7.62x54mmR and .30-06 Springfield are among the few cartridges that remain in circulation nowadays. Rugged, precise and time-tested, these venerable rounds are indeed excellent choices for recreational shooting. But in a 7.62x54mmR vs .30-06 Springfield competition, which one would come out on top? So you want to take up recreational shooting as a bobby but unable to decide between 7.62x54mmR and .30-06 Springfield? In that case, you have come to the right place. This article could provide you with everything that shooters need to keep in mind about the cartridges including their developments, field performance and so on. Generally speaking, each round possesses qualities that certain people value while others neglect, it’s all come down to preferences. Check out the following information if you wish to pick the cartridge that suits you. In the late 19th, early 20th century, the U.S. military leaned toward heavy bullets which explain the adoption of service rounds like .30-40 Krag and.30-03. These cartridges use the same 220-grain round-nose bullet that was falling behind France 8mm Lebel, German 7.92×57mm Mauser and British .303 British in overall performance. To address that shortcoming, the U.S. military decided to develop a new round that a spitzer flat-based bullet with a weight of 150 grain. That is how .30-06 Springfield comes to existence and it would serve alongside U.S soldier up until the Vietnam War. From the outlook, .30-06 Springfield seems to be slightly longer than 7.62x54mmR but that most substantial difference is the rim. In case you are new to firearms, rimmed cartridges have a flange around the bottom of the case to aid extraction in single-action guns. On the downside, round that have a rim often experience a couple of issues in auto-loading weapons (reloading, feeding,…). 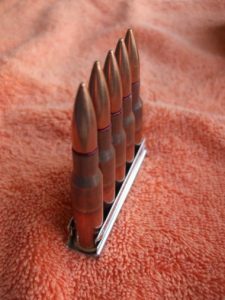 Because of that, the majority of service rifles are chambered in rimless cartridges but rimmed cartridges could be put to good use in some platforms. Important Note: Since both .62x54mmR and .30-06 Springfield see extensive actions in WW1 as well as WW2, you would likely come across some surplus ammunition. Despite the fact that you could safely shoot rounds of military origin, keep in mind that they might use corrosive primers which lead to fouling. Therefore, if possible, consider acquiring new-production cartridges that use non-corrosive primers to preserve the quality of your gun. In the case you only have access to cheap surplus rounds, you need to clean your rifle thoroughly after shooting. While there are many variants of 7.62x54mmR with some of them optimized for accuracy, the precision of the cartridge as a whole is reasonable. In fact, the Russian round is actually comparable to the much later 7.62×51mm NATO when it comes to muzzle velocity, kinetic energy and so on. In the hand of a trained shooter, 7.62x54mmR is able to deliver 1.25-inch groupings at 100 yards so it performs rather well for its age. Of course, the quality of the rifle also comes into play, especially if you are using a refurbished Mosin–Nagant. As long as you could handle the recoil of .30-06 Springfield, you should have no trouble landing rounds on the target. In most of the case, the cartridge would deliver 2-inch groupings at 200 yards assuming that you have a steady aim. 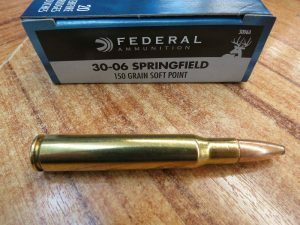 For that level of accuracy, .30-06 Springfield is considered to be a great option for recreational shooting in the great outdoors. Overall, the round would produce good results from 250 to 500 yards. If you feel that factory-loaded rounds are not up to the task then it’s a good idea to put together some handloaded ones. For people that wish to secure a steady supply of rounds, 7.62x54mmR is a good choice thanks to the excellent availability of surplus ammunition. You should be able to purchase as many rounds as you like at cheap prices so it’s financially sound. Of course, you need to clean your rifle thoroughly after use but that is still far from a difficult challenge. With a high ballistic coefficient, the bullet of the Russian cartridge retains energy over extended distances which offer deep penetration. A well-aimed shot shall take down most games in the wilderness with relative ease. In term of shortcoming, 7.62x54mmR lose to .30-06 Springfield in a couple of aspects such as service pressure, case capacity,… Hence, assuming that the length of the barrel is the same, .30-06 Springfield is likely capable of offering superior field performance. That being said, rifles chambered in .30-06 Springfield tend to come with a shorter barrel than their 7.62x54mmR-chambered competitors. Similar to its Russian counterpart, .30-06 Springfield is also available in virtually every gun store, you could choose between wartime surplus ammunition and new production rounds. Many experienced shooters think that the round is sufficient to tackle every animal in North America as well as a great portion of African games. While the kick of .30-06 Springfield is at the upper limit of human, it’s manageable. Depending on the purpose of the trip, you could either use lightweight bullets for velocity or heavy bullets for penetration. The most serious drawback of .30-06 Springfield is that it might cause first-time, recoil-shy shooters to develop a flinch. So if you never handle a rifle before, start with litter bullets if you want to try out the cartridge. Although people could purchase factory-loaded ammunition from every gun store nowadays, handloading remains a common practice among shooters that want to customize their rounds. So let’s see how 7.62x54mmR fare against 30-06 Springfield in term of handloading capability. Considering the fact that surplus ammunition is plentiful, it’s actually a bit hard to produce handloaded 7.62x54mmR because of the scarcity of components. 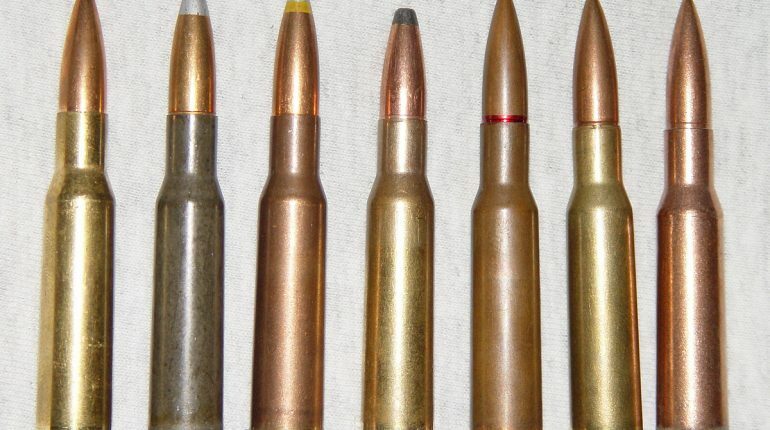 Namely, you have to gather bullets that have suitable diameters which is a challenging task: manufacturers are struggling to meet the demand of common bullet so few pay attention to the need of obscure rounds. That being said, it’s still possible to get some quality projective on the market such as Sierra Pro-Hunter. In term of powder, Hodgdon Varget is a good option. Regarding the case, a lot of people wonder if they could grab military surplus and reuse the brasses once fired. In reality, those rounds often give troubles to handloading enthusiasts as they use Berdan primers. Handloaders claim that compare to Boxer primers, Berdan primers is fairly difficult to work with as they require special tools. As a result, you have to search for cases of 7.62x54mmR that are designed for Boxer primers if you want to assemble handloaded rounds. Fortunately, the brasses tend to last for a long time thanks to the relatively low recoil generated by the bullet. 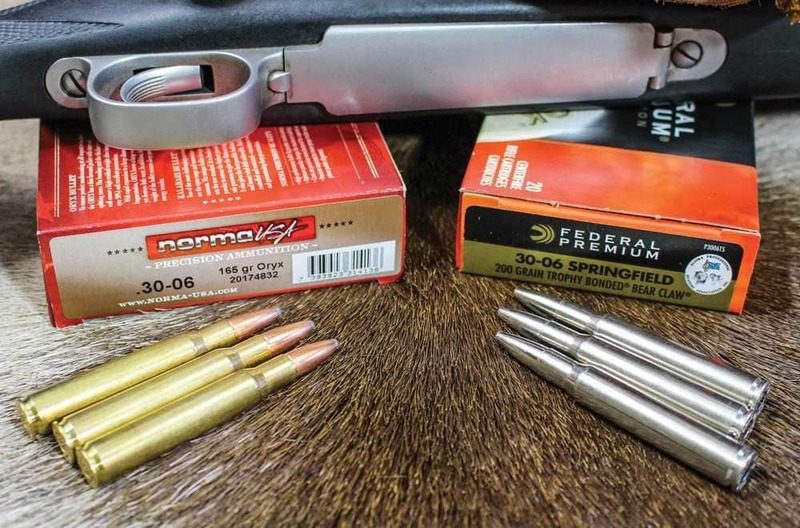 In contrast with 7.62x54mmR, .30-06 Springfield offer multiple configurations when it comes to handloading so all you have to do is select the right loadout. For the propellants, powders like IMR 4831, W760 and H4985 are excellent choices for handloaded 30-06 Springfield. In case you want to go on hunting, normal loads should be sufficient to take down coyotes, deer and moose. On the other hand, if you want to have a good time at the range, consider using Reduced-recoil loads. In term of available bullets, .30-06 Springfield is able to accept various projectiles from 90 to 220 grain. Needless to say, you have to process the brasses thoroughly before assembling the rounds in order to optimize ballistic performance. If your rifle happens to be a bolt action model then feel free to take advantage of neck sizing techniques. However, if your rifle employs different mechanisms, you have to full-length resize the cases. Additionally, take the state of your file barrel into account in order to pick the best handloading recipe for you. Shooters like to use a cartridge that is used in many firearms so they could switch between platforms as they see fit at moment notice. That is why if you are eyeing 7.62x54mmR and .30-06 Springfield, it’s wise to see the number of rifles chambered in these particular rounds. As 7.62x54mmR possesses a long service history in the military, it comes as no surprise that a wide selection of rifles utilizes the round. For shooters that want to have something of military origin, there are refurbished rifles that see service in WW1, WW2 and also the Cold War. Being built to withstand the unforgiving condition found on most battlefields, these decommissioned firearms shall perform admirably in recreational shooting. In the case you experience regulation issues, you could purchase rifles that sporterized in order to comply with weapon laws. Since 7.62x54mmR was developed in Russia, the country obviously offers a lot of rifles chambered in the round, military as well as commercial variants. 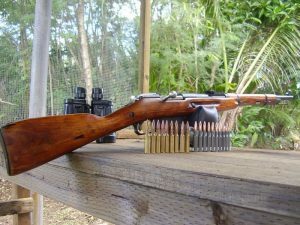 Mosin–Nagant, the first rifle that uses the round, is the best bet for recreational shooters that want to have a robust bolt-action weapon. SAKO in Finland is also a brand that you have to keep an eye out for if you want to buy 7.62x54mmR-chambered rifles. For people that prefer a fast firing rate, it’s a good idea to check out SVT-40, SVD and Vepr. Overall, you have quite a few options to choose here. Similar to 7.62x54mmR, .30-06 Springfield boast an extensive military record though it got phased out of service in the 1960s. Nonetheless, people could still acquire ex-military rifles chambered in the round as the availability of such weapons is superb. For shooters that to have modernized firearms, many well-known manufacturers have released .30-06 Springfield-chambered rifles to the civilian market. 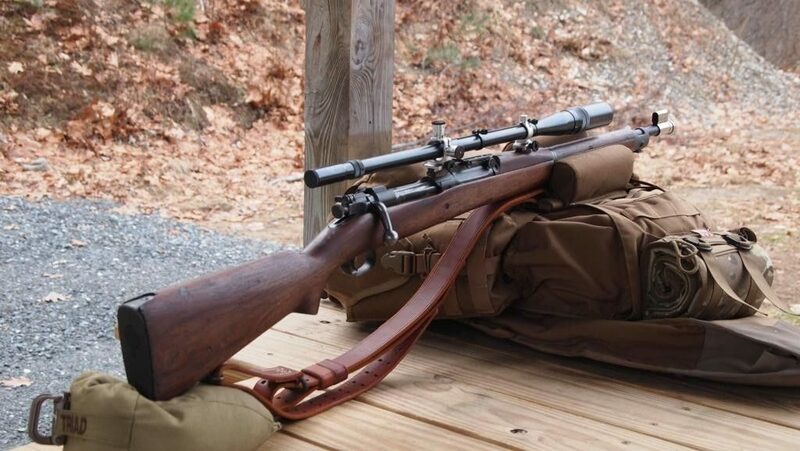 Compared to the venerable World War-era rifles, modern-day rifles are superior in a lot of aspects such as weight, handling, accessory and others. 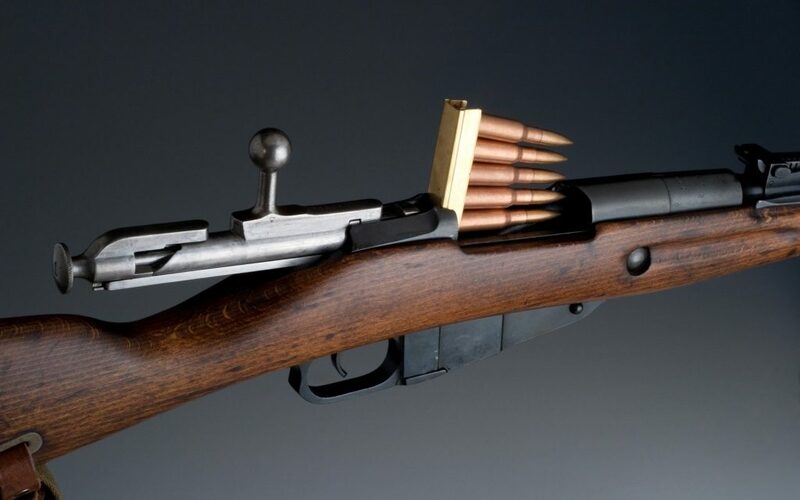 Overall, if you have interests in the history of military rifles, take a look at M1903 Springfield, M1 Garand and M1918 Browning Automatic Rifle (BAR). Although you might have to spend a good amount of money to secure these weapons, they are excellent choices for people that into vintage firearms. Otherwise, you should look for brands like Winchester (Winchester Model 70), Browning (Browning AB3 Hunter) and Remington (Remington Model 783) if you need to shoot some .30-06 rounds. If you want to make quick follow up shots, Browning BAR Mk3 Stalker, Ohio Ordnance Works HCAR and also Noreen BN36 should meet your demand. Both 62x54mmR and .30-06 Springfield have different qualities that attract different shooters so it’s hard to conclude which round is superior on the field. That is why it all comes down to you: compare your shooting style with the characteristics of the round in order to make a decision. Overall, if you want to get used to firearms while having a limited budget, 7.62x54mmR is a good start. On the other hand, if you wish to get some solid shooting experience, it would be wise to consider .30-06 Springfield.